Please note, we have a reasonably good e-mail connection here in Maphutseng but it is susceptible to bad weather conditions. Please bear with us and we will respond to your e-mails as quickly as we can. If you require an urgent response please also call/sms using the numbers below. We would also appreciate if e-mail attachments can be kept to a minimum. 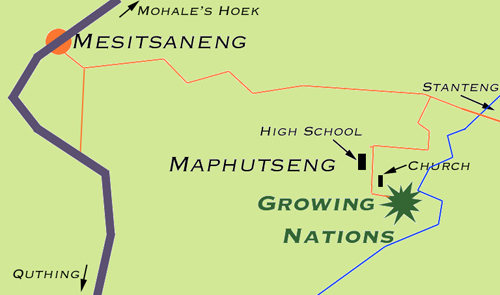 We are located at Bethesda Mission in the village of Maphutseng, near Mohale's Hoek, Lesotho. To make a donation to Growing Nations, please visit the Support Us page where you can see the latest needs and make on-line donations.